Rupert Brandt and Peter Cawston recently joined Brown Advisory, bringing with them the Latin American strategy they have managed for more than a decade. In this conversation, the two portfolio managers share their perspectives on a market in which they’ve invested for a combined 28 years, and why they view Latin America as one of the last great untapped investment opportunities in the world. Q: Can you provide some basic context on the Latin American opportunity? Well, first things first—this is a big economy and a big opportunity. We are essentially talking about six countries: Argentina, Brazil, Chile, Colombia, Mexico and Peru. Brazil on its own is roughly equal to India in terms of GDP. Taken together, these six countries have a population approaching half a billion people, and produce just under U.S. $5 trillion in GDP1. A powerful long-term economic transformation is in progress in Latin America. The dictatorships, currency pegs, hyperinflation and guerilla warfare of the 1980s have gradually been replaced in these six countries by democracy, floating currencies, independent central banks and, for the most part, peace. 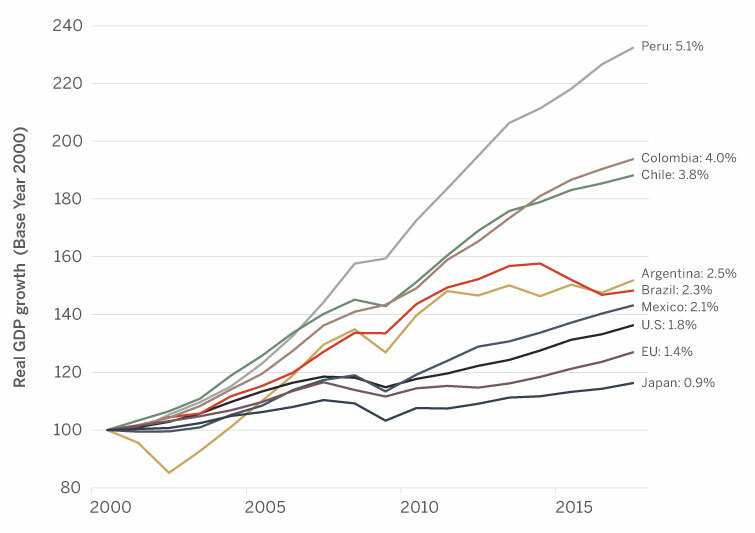 Inflation is a particularly clear window into the transformation in the region; in five of these six countries, inflation has fallen from the 100% range in the 1980s and early 1990s, to low single digits today (Argentina is much earlier in its transformation but following the same model). Middle class growth (from barely 20% of the population in 2002, to more than 35% today2) is also transforming Latin America. In addition to its greater purchasing power, the middle class also has something to lose and is thus, in our view, more supportive of governments with pro-business approaches. Latin America is one of the last big markets in the world to mature, and we see the potential for top-line growth similar to that of emerging Asia in recent years, possibly with much better bottom-line results. Asia’s GDP growth has often failed to translate into high returns on invested capital (ROIC) for Asian companies. One reason is the ease with which Asian companies can borrow, leading to high debt levels in many cases. In Latin America, high interest rates were the norm for many years, so the best management teams there have real discipline around generating a return on invested capital greater than the cost of capital. This helps them transfer GDP growth more readily to their bottom lines. Despite various economic challenges faced in the region over the past twenty years, Latin America's economic growth has outpaced that of developed markets. Notably some of the fastest growth is in Peru, Colombia and Chile―these countries are a notable weighting of Brown Advisory's Latin American Strategy relative to the Latin American indexes. The portfolio information provided is based on a representative account and is provided as supplemental information. Source: Bloomberg. Growth rates cited in the right column are annualized. Q: You’ve covered Latin America for 20 years. Why do you think the opportunity is particularly attractive now? Conversely, what are some potential downside risks? We think that today is a great point of entry into Latin America. First, the region appears to be at an early point in its economic cycle. Latin American economic upturns in the postwar era have all lasted at least five or six years, and this cycle looks particularly promising as all six of our economies are poised to benefit from recent structural reforms, and their currencies are attractively valued vs. the U.S. dollar which should help them compete globally in our view. Corporate margins are not above long-term averages. Economic policy in the region, in our view, offers a fairly benign outlook—interest rates are reasonable (with the notable exception of Argentina), private sector debt is relatively low, and Latin America is not unwinding a major quantitative easing program like many other regions. Second, we believe that currencies in the region are undervalued. We do not try to forecast currency movements, but we always want a view on whether currency is more of a risk or opportunity at a given moment. Right now it appears to be an opportunity—the real effective exchange rate vs. the U.S. dollar is below its 20-year average in most of the markets in which we invest, despite the improved economic conditions in these countries. Finally, the valuation picture looks attractive in our view. Our portfolio has generated admirable earnings growth since the strategy's inception, and the companies we own were producing an adjusted 19% return on equity and had an adjusted 0.8x net debt/EBITDA ratio (excluding financials)3 as of late September 2018. Those are robust results for a portfolio trading at approximately 13x estimated adjusted 2019 earnings – a multiple that should rise if earnings accelerate as we expect3. We see this as an unusually low valuation at the beginning of an economic acceleration, offering incremental return potential for proactive investors. So we see all of these economic, currency and valuation factors converging to produce an attractive outlook over a five-plus year time horizon. There are always risks in emerging markets, however. A recession in the developed world, a Chinese debt crisis, a retrenchment of commodity prices, or a reversal of positive structural trends in these countries--all of these are possibilities that could set Latin American markets back. And the region’s stock markets are still vulnerable to rapid inflows and outflows of foreign capital (an inherent challenge for any emerging market portfolio). Time has taught us to be patient about the "two steps forward, one step back" pattern that can play out in Latin America. Setbacks occur in different countries at different times, and these situations sometimes—not always—create opportunities for us to add alpha. The latest ongoing example is in Argentina. For the past several years, Argentina’s new pro-market government has been actively reforming the economy—deregulating prices, sorting out the fiscal deficit, sorting out inflation and encouraging private investment. A big part of the country’s economic story is rooted in its agricultural sector, and when it suffered its worst drought in 50 years in 2018, it triggered significant currency weakness and a selloff in its equity markets. The government has responded in an orthodox manner, taking steps such as raising interest rates sharply to stem inflation. We believe that the long-term fundamentals in Argentina are still very promising, and we expect to see the economy recover and re-establish attractive GDP growth in 2019. Given current equity valuations combined with a relatively inexpensive currency, we have had the opportunity to invest in some appealing Argentinian companies at attractive prices. The middle-class explosion that has driven growth in emerging Asia is also occurring in Latin America. 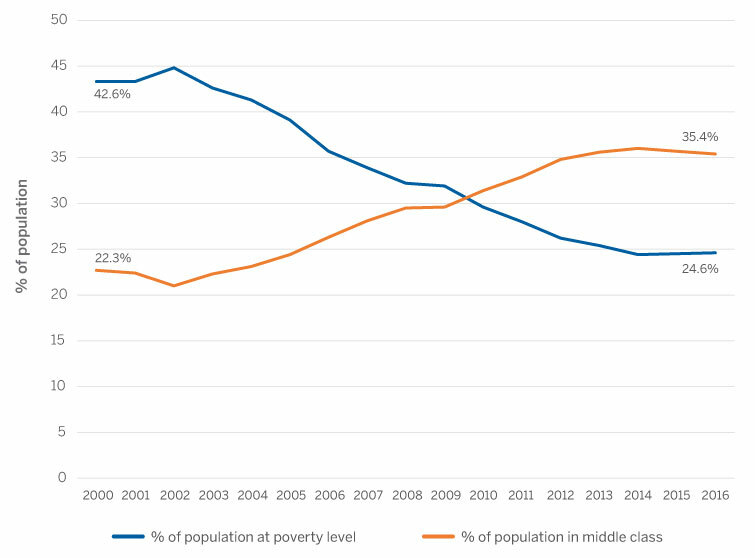 The percentage of Latin Americans with middle class incomes has risen dramatically since the early 2000s, which has led to a boom in consumer spending and, indirectly, the popularity of more market-friendly governments. Source: World Bank. Poverty level defined as income of approximately $5.50 USD per day or less; middle class defined as income between $13 and $70 USD per day. Q: Do you think investors need specific exposure to Latin America? We think it makes sense to invest in Latin America, given the bottom-up opportunity and compelling valuations. But benchmark-driven emerging market (EM) strategies don’t offer a lot of Latin American exposure currently. These indexes are market-cap weighted and backward-looking in their construction, so they will not reflect a higher Latin American allocation until share prices have meaningfully rerated in response to the economic resurgence we are seeing in the region. For that reason, we think that investors seeking to capitalize on that resurgence are better served by having specific Latin American exposure. That being said, we think our value-add is more rooted in stock selection than in regional exposure. We focus primarily on absolute returns, and don’t guide the portfolio relative to any benchmark. One of our portfolio companies, Nutresa, is a good example—we own it for fundamental reasons, not because it gives us exposure to the region or to Colombia. Colombia offers tailwinds to be sure—it’s a free-market democracy where GDP per capita has grown 2.5x since 20004. But the bulk of our thesis is based on the company itself. We believe that it has excellent brand strength across its core categories including cold cuts, chocolate, pasta and coffee, leading to a 60% aggregate market share in Colombia, which accounts for 60% of its business5. It has a strong distribution network that gives it a competitive advantage against multinational entrants in our view. Moreover, comparisons with other countries strongly suggest that demand for Nutresa’s products will rise as GDP/capita and the middle class grow, so it has an immense runway for growth. Q: How does your strategy differentiate from other Latin American strategies? We have a particular focus on "underpenetration” in the portfolio (i.e., situations where an industry has not fully realized its potential in a given country). This focus leads us to companies that have the potential to capture, in essence, three sources of growth. As noted, we believe key Latin American countries are poised for attractive nominal GDP growth; underpenetrated industries offer the potential to grow faster than overall GDP; and finally, our research seeks to uncover companies that can gain share and grow faster than their industries. We believe this focus on underpenetration is a major reason why our portfolio companies have generated strong earnings growth since the strategy's inception, during a decade-plus period that we would describe as peak-to-trough for the region's economies. Additionally, we believe that our benchmark-agnostic approach offers greater diversification of country and currency risk than benchmark-driven strategies.The MSCI Latin American Index is market-cap weighted, so Brazilian and Mexican companies can represent as much as 80% of the Index at times. The Index can also have meaningful weights in companies that we think are unattractive from a fundamental standpoint— state-owned businesses with poor governance influenced by politics, energy and other commodity companies, and companies in slower-growth sectors such as telecommunications. Petrobras—driven by the inherently unpredictable price of oil, and governed by political appointees that change with every election—is a good example; it's a large constituent within the Index, but it is not the kind of model we want to back with our clients’ capital. In contrast, we seek to invest broadly across countries with solid long-term fundamentals and improving policy environments, and in high-quality growth stocks with long growth runways that operate in clearly underpenetrated domestic industries. Our portfolio is more diversified than the Index across the six major economies in Latin America (for example, Peru made up about 15% of our portfolio as of June 30, 2018, vs. only about 4% of the Index6). We only invest in "private" (i.e., not state controlled) companies with managers clearly aligned with shareholder interest; we don’t invest in state-controlled companies and we avoid commodity and low-growth stocks; and, we only invest in companies where we think long run results are relatively predictable and we believe that profits will compound well over time. A benchmark-agnostic approach will inevitably have periods when it exceeds and lags benchmark indexes that other strategies track more closely. However, over the long term our strategy has generated higher returns than the MSCI Latin American Index, at similar levels of volatility, since its 2006 inception. Finally, we believe that we know these markets very well after many years of visiting and investing in Latin America. There are about 100-150 companies of real interest to us. We each visit the region several times per year, so between us we usually spend 15-20 weeks a year in the countries we invest in and conduct 300-400 meetings with this select list of firms each year. In addition, we attend Latin American conferences and meet Latin American companies in London when they are doing non-deal roadshows (many come to London once or twice per year). So we’re very close to the data and to each company’s strategy and management team. Q: How can investors access the strategy? Investors can access the strategy through the existing UCITS Fund or through a segregated mandate. In the U.S., the strategy is available via segregated mandate, and we have plans to launch an SEC-registered mutual fund in the near future. 1Source: World Economic Outlook Database, April 2018, International Monetary Fund. 2Source: The World Bank, LAC Equity Lab: Poverty – Poverty Rate. Data from 2000–2016 updated and published in April 2018. 3Source: Bloomberg, Brown Advisory and broker estimates. Characteristics exclude cash and cash equivalents.The return on equity or ROE figure cited is an adjusted trailing 12-month weighted average. Companies with a negative ROE were removed from the calculation. The calculation is as of Sept. 19, 2018. Further details on calculation methodology are available on request. The unadjusted ROE is 17.0%. The unadjusted estimated 2019 earnings are 13.9x. The portfolio information provided is based on a representative account and is provided as supplemental information. 5Source: Grupo Nutresa Corporate Presentation/Fact Sheet. Return on Invested Capital (ROIC) measures a company's profitability in the context of the capital it invests in its business. It is calculated as NOPAT/IC; where NOPAT (net operating profit after tax) is (EBIT + Operating Leases Due 1-Yr)*(1-Cash Tax Rate) and IC (invested capital) is Total Debt + Total Equity + Total Unfunded Pension + (Operating Leases Due 1-Yr * 8) –ExcessCash. The MSCI Emerging Markets (EM) Latin America Index captures large and mid cap representation across 5 Emerging Markets (EM) countries in Latin America which include: Brazil, Chile, Colombia, Mexico, and Peru. With 109 constituents, the index covers approximately 85% of the free float-adjusted market capitalization in each country.